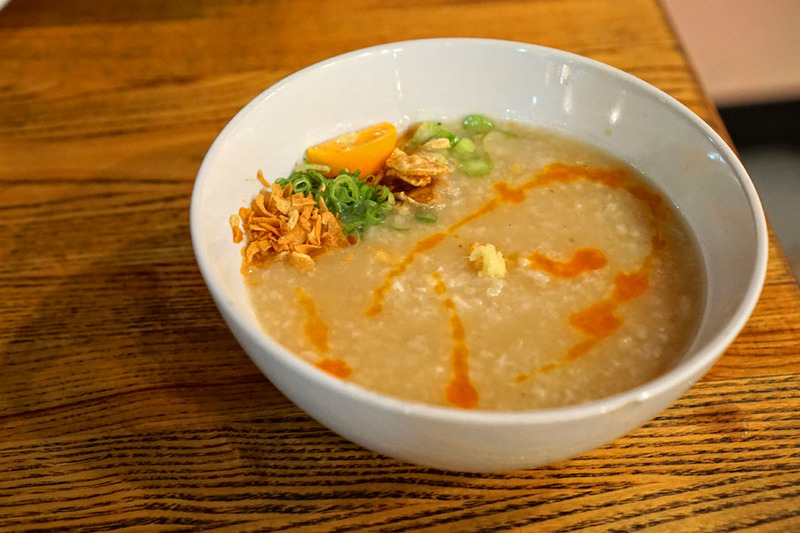 Since opening in mid-2016, Ryan Garlitos' modern Filipino spot Irenia has quickly become one of my go-to restaurants in Downtown Santa Ana, and in fact Orange County in general. I've been back here a number of times since my initial report on the place, so I figured that it might be time for another post. 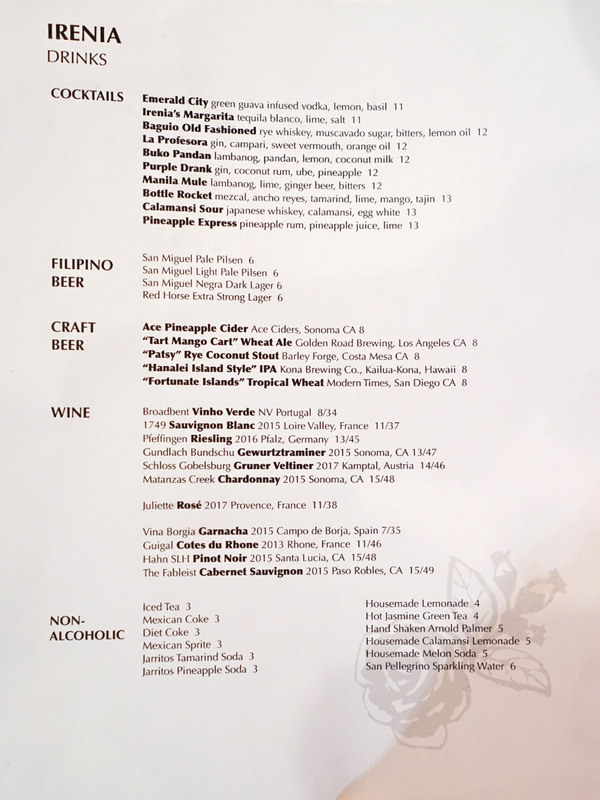 The menu has been in pretty much continuous evolution since Irenia opened, though there are a few standby dishes that have never left. 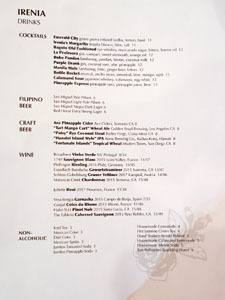 Drink-wise, we have Philippine-inspired cocktails, some beer, and an abbreviated wine list. Click for larger versions. 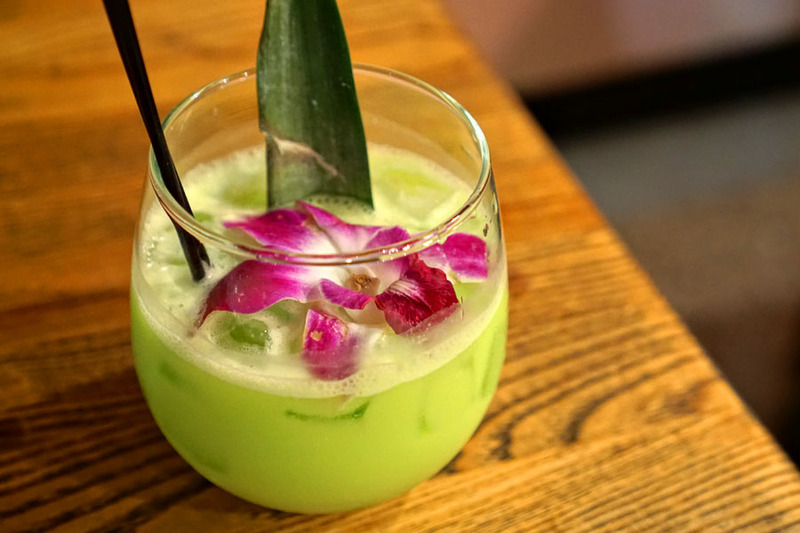 We began with a vibrantly-hued cocktail ostensibly inspired by the Filipino dessert buko pandan. Though based on a potent distilled coconut spirit called lambanóg, this was easy-drinking, displaying a tropical, coconut-y sweetness married with grassy, aromatic notes of pandan. The aroskaldo was a must-try for me, and didn't disappoint. 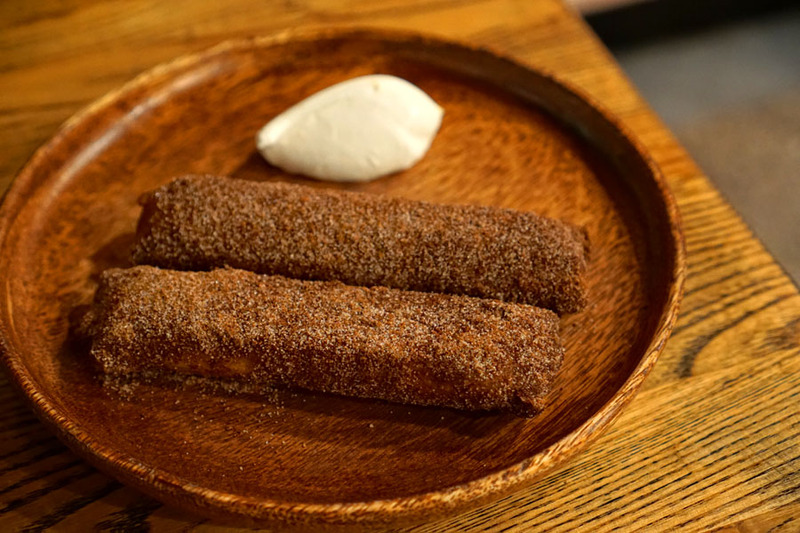 It was a super cozy sort of dish, savory and gingery at its core, but with a delightful funk (patis perhaps?) and underlying heat. The salt and crunch of the chicharrones was much appreciated too, as was the brightness provided by the veggies. A superb start. 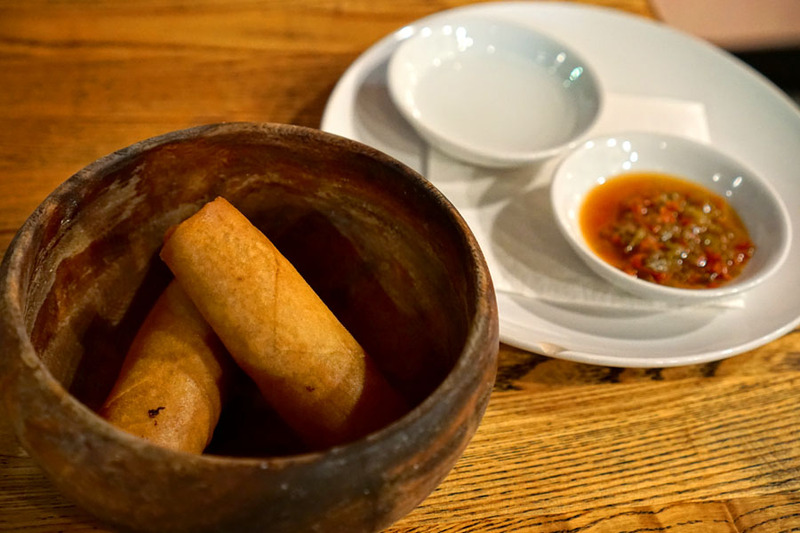 Irenia's lumpia were just about perfect, and featured a savory, satisfying, familiar filling of pork and vegetables, all encased in a thin, crisp wrapper. They were delicious alone, but even better with a dab of that sour, vinegar-based dipping sauce on the side. 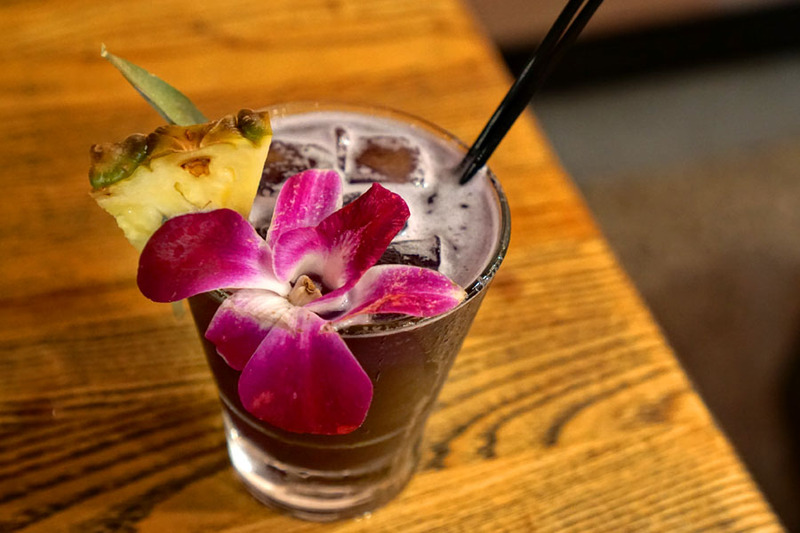 Our next cocktail conveyed the familiar sweetness of ube in concert with coconut, with the tartness of pineapple serving as a counterpoint. 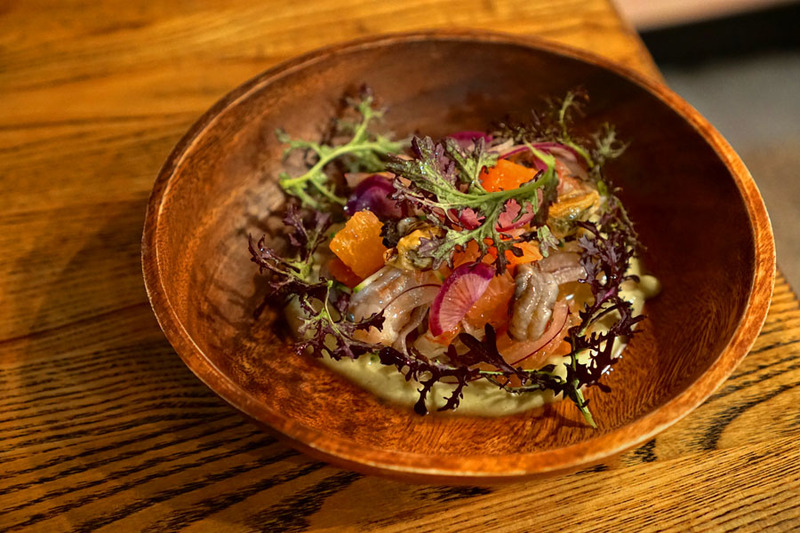 The ceviche-esque kinilaw featured fresh, snappy prawns and mussels, set in an avocado cream sauce. Unfortunately, said sauce was a bit much, and tended to overwhelm the delicate flavors of the seafood. I did appreciate the zesty slivers of red onion here, as well as the juicy cuts of citrus, both of which helped lift the dish. The pork stew definitely delivered, thanks to its homey, deep-yet-delicate broth, one smartly matched to the bitterness of the various veggies. 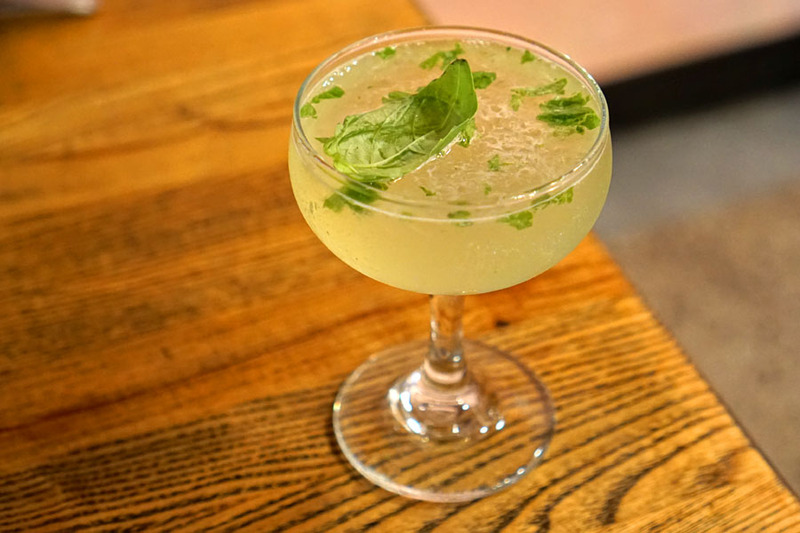 Taking its name from the city of Muntinlupa, this next cocktail was definitely on the refreshing side. I got loads of basil up front, along with sweet, "green" flavors cut by tart citrus. Here was the most intriguing course of the evening. Coated in a rich, sticky, savory dressing, the kamote was tempered in its sweetness. 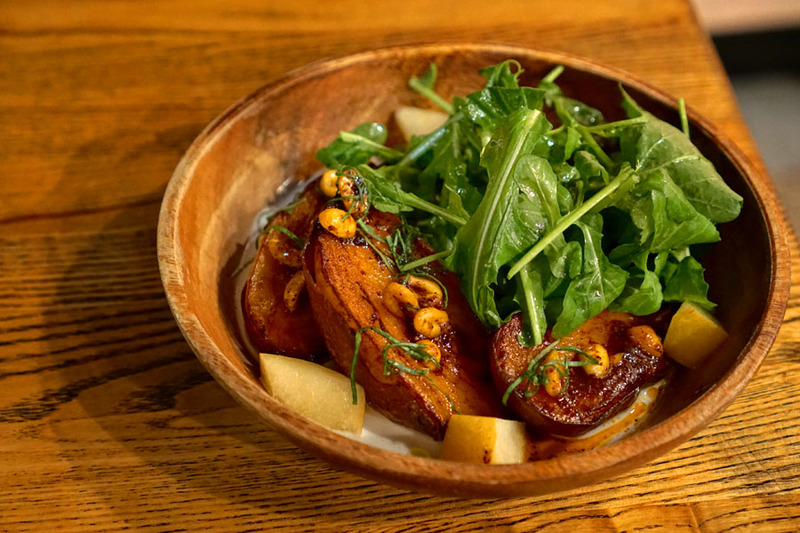 It actually paired really well with the zestiness of arugula, while the pears imparted a juicy, tangy element. The coconut cream emphasized the sweeter notes in the dish, but even it wasn't domineering. 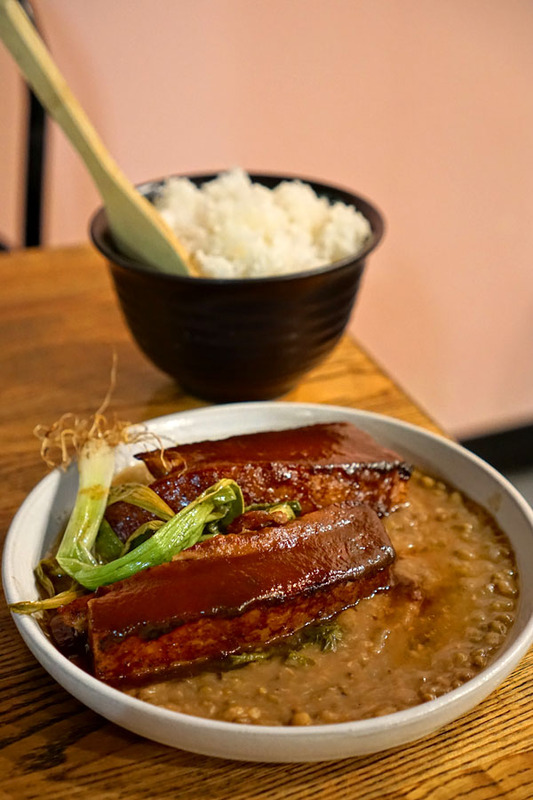 The adobo has been on the menu since pretty much day one, and for good reason. 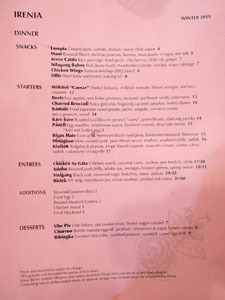 The belly arrived fork-tender, and showed off a bevy of dark, savory flavors, evened out by a touch of tartness. Bitter braised greens served as an effective foil to the meat, and I was a big fan of the moderating effect of those mung beans, too. Be sure to make use of the included rice as well. 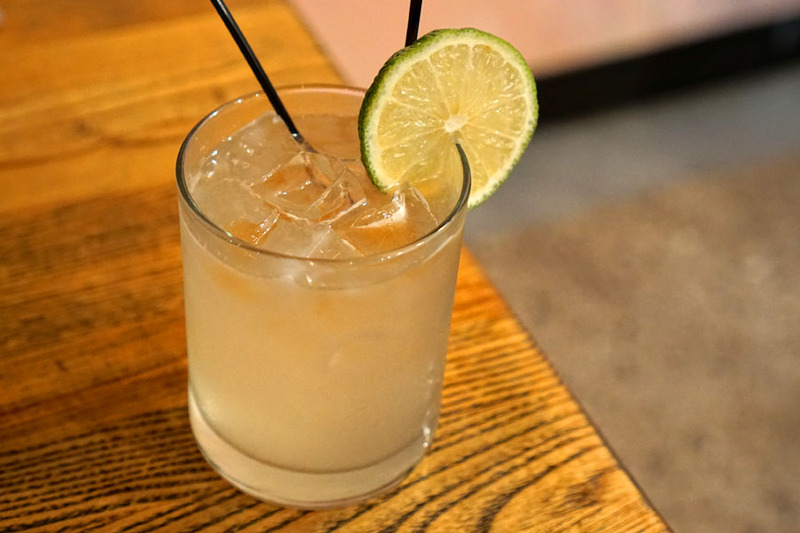 This riff on a classic mule cocktail showed off the potency of lambanóg, offset by the spiciness of ginger and a bit of bitterness on the back end. 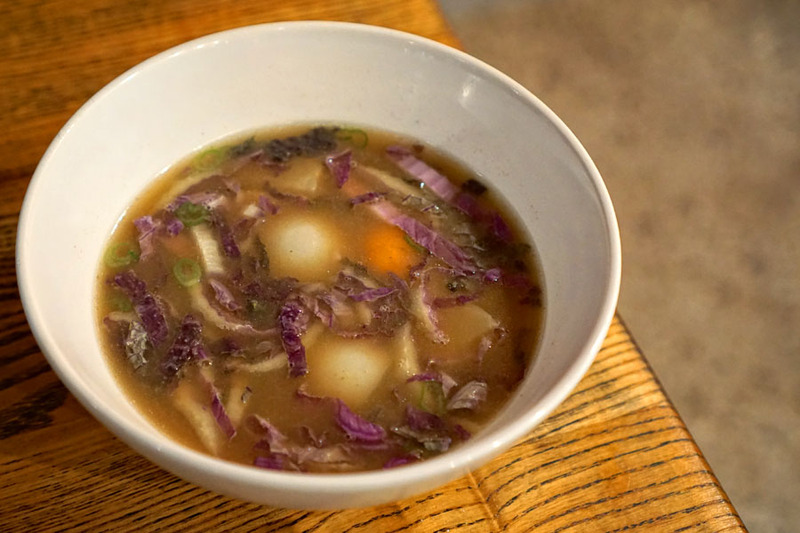 We ended with the sa gatâ, effectively a coconut-y variation of adobo. 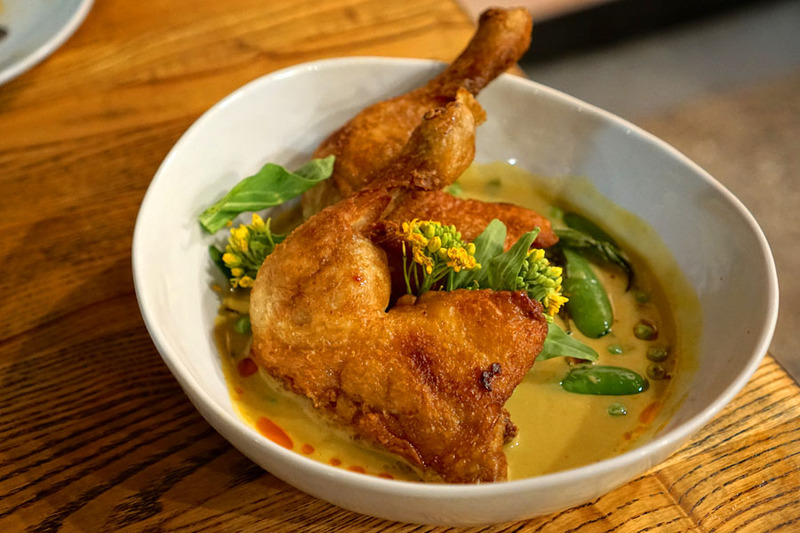 The chicken was immensely, immensely flavorful, with a supple consistency and a wonderfully light, crispy, flavorful skin. It matched well with the included coconut curry, while the greenery imparted a necessary brightness to the mix. My only concern was that the bird was a touch dry in places. 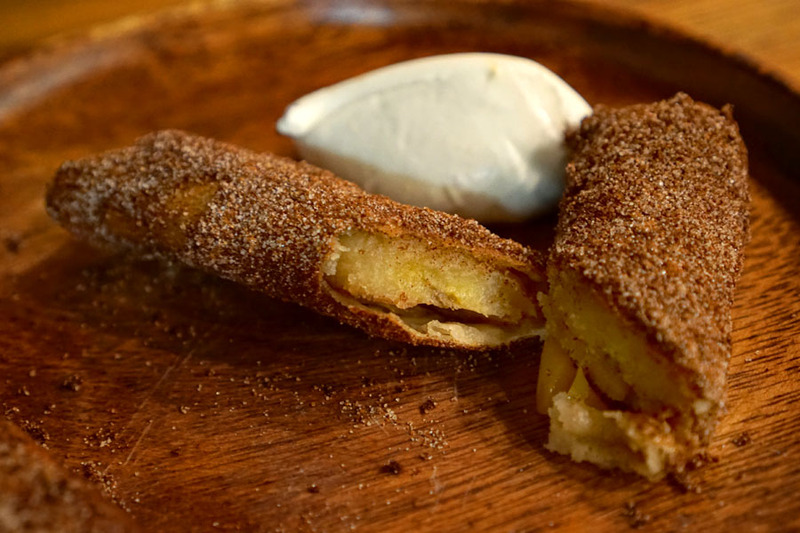 Dessert duties were handled by this churro-turon hybrid. It was a fun combination for sure, with plenty of sweet spice working hand-in-hand with the banana, all while the jackfruit provided a textural element. Great crispness on the spring roll wrapper here, too. 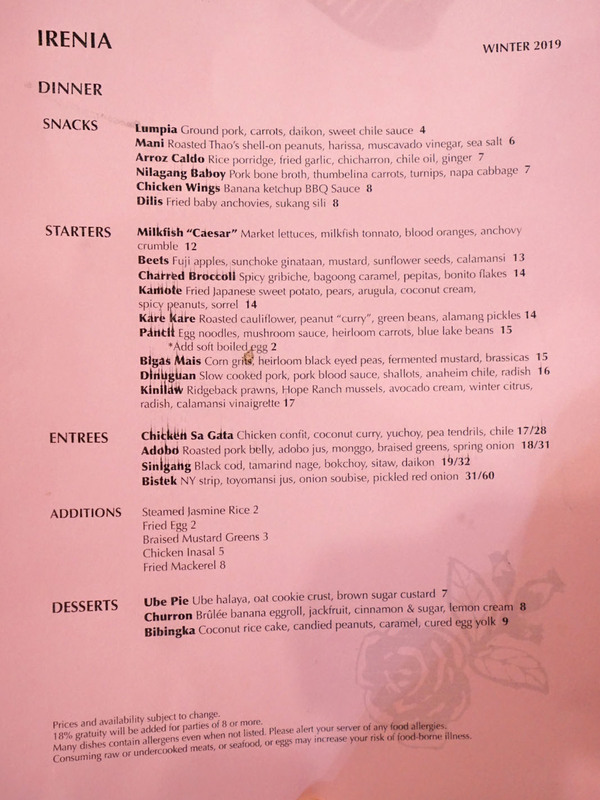 I enjoyed yet another strong meal at Irenia this evening--just the latest in a long line--and that's the reason why I keep coming back here. I've enjoyed seeing how Garlitos' cooking has grown since the restaurant opened, and I hope that the place sticks around for a long time so I can keep on comin' back. An essential spot for OC I'd say. You can get the same food experience at Jollibee at half the price. Where are the ladies at? Jollibee is trash. Popeyes chicken baby. Church's chicken is better than Popeyes or Jollibee. You can come fight me if you disagree. Believe it or not, Sizzler has some decent wings that are on steroids.